[00:22] Alright, unit your dust real professional from all around the world. Thank you very much for joining the industrial talk podcast. You know, I'm your cheerleader, I just love the industrial world and I, I really appreciate what you guys do out there, so thank you very much for joining the industrial talk podcast. I need for you to just reach around your side, grabbed that buckle and buckle in because we've got a tremendous show. We're interviewing a gentleman by the name of Luke Wyckoff and he is the CBO, the chief visionary officer with the Social Media Energy out of Denver for does he bring the energy? It's an exciting time. Great interview. He brings tangible stuff, so let's get going. [01:01] Yeah. Thank you very much for joining the podcast. I really enjoy this. I enjoy being with you guys and all that fun stuff and I'm, I'm just, you have no idea how excited I am to, uh, to bring you this Luke white coffee interview because he's, he does bring the energy man. It's a lot of flood and he knows his stuff big time and if you're out there on my YouTube channel and you'll notice that I've got a bowl of my macros, macros, that's a perfect blend of protein, carbs and fats. And my son is training me for an event in the end of September. It's an old man event and it's a physique con. Anyway, I've lost 10 pounds eating this way. Uh, it's not exciting, but it works. And so anyway, I'm going to be posting some stuff of how my son abuses me at the gym and makes me eat this stuff. [01:51] Now, once again, I'm going to refer to Luke, but before we get going, we're going to have to start out with our tailgate talk because we want to start off safe tailgate talk number one. Okay? The first thing I'm always reading, and here's a book that I'm reading right now and it's called blue ocean shift and it's, uh, it's, it's been great blue ocean shift talks about, uh, taking your existing business model. They're looking for opportunities that are really outside. I highly recommend it because I think you need to know a little bit about that great strategy and that was referred to me by the gentlemen who have John Grubbs. He's been on the podcast a couple of times. He knows his stuff. Excellent raid. I highly recommend that you read it. Number two, you know, I'm passionate about you, the industry professional, you, the industry owner, business owner and a, everything is focused to making your success, filling that funnel because that's important stuff. [02:50] And um, a couple of things that we are transitioning into. I'm using a platform called teachable.com. Now this is relatively new and been publishing a series called business beatitudes, beautiful attitudes for business leaders and uh, it takes into a seven, maybe a points of what that looks like. And I always, I'm always intrigued by purpose, but that purpose that is driven by the heart so that all those articles will be also out there. I publish on LinkedIn as well as Facebook. You can find me out there. And then I'm working with a gentleman by the name of Keith McAslan and he's got an extensive background in private equity and we're going to go and we're gonna Create a program called the foundation for business success. He knows his stuff because in the private equity world, that's what they do. They look for businesses, they turn them around and you get the picture. [03:45] So Keith McAslan and I are going to be working on that. That will also be out there on teachable.com. And the final thing, the final thing is I'm working with a gentleman by the name of, uh, Jim Whitt and uh, I view him as a mentor and he's the one that really got me focused on, on purpose and why that is so important in the business. And in fact, if you're looking out on YouTube channel, the video, that's his book behind there. And he is a going to work with us on, hopefully we're working on it. So don't tell them that I'm doing this. No. Anyway, I had a good conversation with them yesterday and uh, we're going to try to put together a, a, a program that really identifies and drives that purpose at home. So I'm pretty excited and it's all going to be put out there on teachable.com. [04:33] And so nonetheless, we've got one more. Number three mega, you know, that I'm affiliated, got a great relationship with these people reliability web and they have a podcast called reliability radio. And uh, for me, I'm very honored to be able to be on that. I am the host of reliability radio and I want to make sure that you keep current with all the activities that reliability web does. And one is July 17th through the 19th, July 17th through the 19th. This is a New Orleans, Louisiana right around the corner from where I live right now. And this is the vibration institute. This is a symposium is focusing on vibration analysis. And, uh, I'm going to be there and I know places that happen in our, in New Orleans, and uh, you got to come up and talk to me so that we can have fun and learn a lot about vibration analysis and have fun. [05:27] So that's one. And then the second one is Maximo World. This is August seventh through the ninth and this is at a Lake Buena Vista, and this is in Florida of course, and it is at the Dolphin and a, if you're an asset manager of reliability, maintenance professional, and you guys use Maximo world considering to use maximum world, boom. That is the event you need to go to. So there you go. That's it. End of the tailgate. Let's get onto the interview. So as I pull up information. So here's this guy, Luke Wyckoff. His background is extensive in the digital marketing realm. And so I look at it as an iceberg, right? And it's because that's the only analogy that I can come up with. And I use that analogy because here in the industrial world we can be better at are in a digital presence. We are leaving money on the table from my perspective and we're not executing on strategies that quite frankly are pennies on the dollars that could prove to be quite profitable because we just sort of look at, okay, here's LinkedIn, we'll post this and uh, you know, this is something and we'll post it on Facebook and then we leave it at that. [06:39] But I'm telling you, if you look at a, a, um, a iceberg that's just the tip, there is so much that lies below that iceberg, strategy-wise, digital wise, marketing wise. And this Guy Keith, that's the other guy, Luke their buddies, by the way, the Luke brings to the table and in this interview he's tangible baby. He gives you concrete strategies to deploy today and of course you can contact them anytime of the day. Right? He's, he's out there. He's prolific. He's got a great company. He's out of Denver. So with that, I'm done. Let's get on with Luke. Thank you very much. Enjoy the interview with Luke white cough. All right, welcome to the industrial talk podcast. I'm so glad that you are joining us. 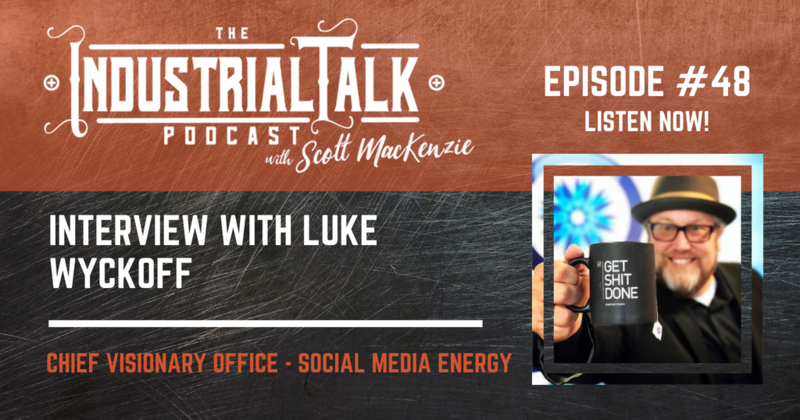 I've got a gentleman by the name of Luke Wyckoff, he's on the horn and he is spending time with you listeners out there in the industrial world. Hey Luke, thank you very much for joining. How are you doing? [07:36] Glad to be here. I had a great fourth of July. Hope you do too. It was a lot of fun. What we did was barbecue and swam. That's pretty much it. And that's it. Nothing else. Yeah. And so anyway, how was your, how was your fourth? [07:53] Ortho is great out here in Denver, Colorado. Interesting. I live, uh, I live in a large loft complex downtown and I lived on. I live on just high enough that you could see over the entire front range looking west and you could probably see, you know, 25 to 30 different fireworks shows all going off the same time from as far south as Colorado Springs to as far north as boulder, just looking west. And it's an absolutely amazing a picture now with the fireworks are illegal in Colorado, right? [08:27] Ah, they're not illegal. The people had to, had to get a, an actual, a permit in order to have them are they also shoot them off over a mile high stadium. They shoot them off over Coors Field. They're playing the giants right now and then they'd do a big, big one right downtown Denver. Also what they do though is a fire. The fire chief always has the last call on whether we have a. We have a emergency forest fire type situation where it's not so safe, so a lot of the western slope, if you go west of Denver, it's either go no go within 48 hours of the, of the actual fireworks show depending on whether we have a forest fire alert, but it's always beautiful. And the mile high city, the C , two c, the fourth of July. A lot of patriotic people, especially with the United States air force, you know, just a 45 minutes. So yeah, you're right about that. That's right. That's pretty cool. Big fighter jets flying over last night, you know, to launch the Rockies and the diets and wrote patriotic. It's just beautiful. [09:35] Nice. Nice. Now the reason why we're talking a Luke, does anybody give you a hard time about Luke? When Star Wars came out? I never hear that. Now I get outta here. You're quite. I give it. I give it five minutes before either one of you say that you're my father. [09:54] See, I wasn't going down at all and I'm not going to do it. I'm not going to do it. I was thinking it was going to happen. So anyway. But one of the things that I was really impressed with you about is how you've gone all in on digital marketing. You have a company and one of the things about the industrial world space, whatever we live in, right? I think that in general we're behind the eight ball when it comes to digital marketing, leveraging the tools and techniques out there because there's a strategy. And I think what, what we do and we don't do well is adapt because we're, we're risk adverse and we don't like change and we don't feel comfortable with that. But give us your, your background, Luke, of why who you are, why you're fantastic. And, and, uh, your company, uh, in a, in a nutshell. [10:47] Well, if you want to know who I am and why I'm fantastic, we'll probably need to get my mother on the phone. She'd be the one who would give you that much better story. My, my company started as a mistake. So believe it or not, my background is industrial and organizational psychology. So if you're in an industrial setting and you're trying to figure out who's the best of the best inside of that company to promoted to senior executive executives, that's the world I came from for 15 years long before I started my digital marketing world. But it wasn't until I was in presenting to a group of companies talking to them about succession management. When all of a sudden one of the CEO says to me, they say, you started your whole company, you've seen the LinkedIn and Facebook, didn't you? And I said yes. [11:36] And they said, what is that stuff? I said, you want to know about social media? And everyone in the hendricks, 13 ceos represented about one point 6 billion in revenue in that room. And I said, everyone shook their head yes. And I said, okay. So I got up on the Whiteboard, no whiteboard and out a three month strategy for this entire role of these companies and I get done. And the CEO over the system says, well, why don't you just do that for us? And I said, do what? He said, all that stuff you just said you could do it. I said, I didn't say I could do it. I said, this is what you should be doing. And, and he said, yeah, we don't have anybody that knows how to do that for us. Would you just do it? I said, you want to outsource your social media to me like you all sorts of counting. [12:22] He said, Yep, let's do it. And I said, let me think about that. So I went and got my old study buddies together from Grad school because they're actually, they're actually huge, a single malt scotch fans. So I knew I could like bring them in and we pro forma out the entire company. We finished it up, I take it back in, they said Yep. And that was the launch of Social Media Energy, which, uh, started nine and a half years ago. And since then we've been voted top five fastest growing private companies twice in Colorado. We're up to 22 employees. We're in five states. We're in every vertical industry that you could possibly think of with a. We do have a quite a few success stories and horror stories within the industrial space that I'm having any of those stories with us. [13:12] Well, of course we want the horror stories because that's important to us, but that's more fun. Yeah, it is. It makes for a more colorful conversation. Let me ask you this real quick. You get that, that gentleman that, that story were you saying, Hey, you do it for us. What was the sort of a general result of huge to say, oh, okay, I'll step in and we'll just implement this three month, whatever strategy. What happened? [13:38] Well, for the entrepreneurs that you have to listen to this podcast, this is normally where I stopped the story. Uh, but for the entrepreneurs, the next part of that story, it was me walking out in the parking lot and going, what the hell just happened where I thought, I don't have a phone number, I don't have an email address. I don't have a website, I don't have a logo, I don't have business cards. Think about everything it takes to get you think you need in order to actually support our company. You've got to prop it up, get it. The traditional way of thinking about starting a company. You're like, I need this. I have to have that. I couldn't launch a company without this. I'm telling every entrepreneur who listens to this show that yes, you can. What it takes, his tenacity and resilience and a lot of energy to go out and make it happen. It doesn't, it's not, doesn't matter how great your website is or other or your other types of things in order to launch and get going. What you need is the most important thing, which is a paid clients. [14:41] She'll read, are you going to pay me eventually? Um, I mean, maybe like in whiskey or something. I mean, you prefer that, right? I do. [14:50] I can't believe. I believe that reads now earning $500 for a show. That's amazing. Yeah. It's a little upwards of that actually. Now we did a little contract deal. Oh my gosh. I better check on that. [15:05] Well, well, so yeah, you're absolutely right. From a, from an entrepreneurial point of view, I think that the worst decision you could make us is a. I quit in a sense because that's sort of that permanent decision to maybe a temporary problem and and there, there, there are no books out there that say. And when I became an entrepreneur it was just smooth sailing and I was just happy as. And we were dancing around and, and, and it was so easy. Yeah. It's tenacity. It's grit. It's, it's, it's that stuff that comes from the gut. [15:37] It's energy. It's. I tell every entrepreneur, you can't live your first year without a paycheck. I'd seriously consider not be becoming an entrepreneur. [15:49] Very good. Yep. Get wise counsel. Most definitely now without origin, there is no Mr. Mission, that's what it says in my bathroom every day without margin. There is no mission, you need revenue number one thing that you need and if you, and that's, that should be your focus going into it. [16:09] Well look, let me ask you a question too. So I'm a little younger. Some of us would really apply to me, but I think this could apply to like calm the older crowd. So you've been doing Social Media Energy for nine and a half years, you said? [16:22] That is correct. Okay. So you were around 39 when this started, correct? Yes, correct. So which already made me a diamond, right? Well that's covered my questions going. So I mean I'm 23 so, but I feel like, you know, in my own opinion, and correct me if I'm wrong, because again, I'm young around that age is when most people are kind of set in stone with what they're doing, you know, they're like, okay, I've been sitting at a desk for like 17 years now. So what gave you the push to be like, you know what, I'm going to take this new path. I'm going to go ahead and I'm going to do this Social Media Energy thing. [16:57] It was what, what gave me that push was I, I've always had one of the behavioral competencies that is very easy to measure. And in fact, one of my, uh, one of my better industrial clients that make office furniture, in fact, many people listening to this podcast might be sitting on steel case furniture today. Oh yeah, absolutely. I'm not one of their areas that they love to assess people in. It is your ability to learn. So the people that are not set in their ways, people, people that are never happy with just knowing what they know, they have this constant desire to want to know more. There's ways to assess for that when you are looking to hire people to come into your company. And that's something that I've always scored very high on is it's not that I'm dissatisfied with what I'm doing now is that I always have a desire to want to learn more. [17:56] And it wasn't until this opportunity came across my plate and I looked and I ran the numbers and said, this is a viable business. I have the energy and the effort. I have the tenacity and the resilience to pull this off. Now I'm going to, now I'm going to continue to go with this and see where it goes, see how far I can take it and what most, what happens with most people and why I'm not all entrepreneurs are successful, is that they go for the money right off the bat and see what, see what is available financially for them and they don't think longer term as to what could be, what could be viable over the next three to five years. They're only thinking about, you know, where, where can I exit quickly, have my pay off day, and then get on my boat in Cabo. So you're quite the answer the answer, the answer your question. It really comes down to, um, when you see an opportunity, you know, you're either going to go, oh, that was a good opportunity. I might have, should have done something with that or you're going to run with it. You're going to make it happen. And, uh, if you, if you, if you're confident in yourself that you have the ability to do that then as an entrepreneur, by all means, go for it. [19:12] You know what's interesting, I, I taught at a couple of universities business, whatever, and one of the things that, it's probably not as sophisticated as what you're used to and the tests that you went through. But I would always tell the class, I said, if you have this thing inside you that, that, that burning desire to do more greater, whatever it is, and you, like you said, you had this desire to learn more. That will always be with you until that moment in time where you truly try to execute upon it and say, I want to be an entrepreneur because I'm just restless in this quote environment that I'm currently in. I'm young, I got this, you know, I'm smart. I think I can do it. I got grit. And it's always in that conversation. Always happens because there's, there's, there's young people that say, I just want to find, uh, accompany, uh, you know, get my, whatever it is. But then there's always those ones that are saying, I can't, I can't do that. [20:06] I've seen people that are the 23 year olds that have amazing a tenacity to get out there and make it happen. But I'm guessing a lot of people that could be listening to this podcast might be just a little bit north of 40 and if they are, you need to. You need to know. I've seen some of the coolest ideas and companies launch in Colorado with people that are in their early fifties, mid fifties, mid sixties, that have. They have a vision that are very smart at what they do and they're bringing decades of wonderful red flags and experience to the table and and they're ready to launch. They're ready to watch. The only thing I know, anything I say to the entrepreneurs out there, whether it's an industrial product or whether it's a technology or something like else, do you have a viable product? [21:29] this or this? That's a great point. Let's, let's, let's shift gears a little bit in and start to expand upon that particular, I guess topic now. Wherever you, um, no, no, this is great. This is good. Good segue. Good segue. So in the industrial world, we've got really, you know, big companies, the Chevrons, then you know, the big companies and those companies are supported by small to midsize companies because whatever Chevron it, you get the model, you get the, the spoke wheel, whatever concept, the product, right? Why is it important for these companies to truly contemplate a a digital strategy for their marketing, for the branding, for their expansion, for filling that funnel of opportunity? Because what happens in the past is that just sort of like how you got started, somebody came to that guy and said, hey, dig that ditch. Okay, I'll dig that ditch, man. You do a good job digging that ditch. Can you run a forklift? I can run a forklift. Sure. Boom, they run a fork lift and then all of a sudden that's the genesis of their industrial business, but it stays in that sort of realm. I want to hear from you about how you leverage the digital marketing in this environment to expand brand market, all of that good stuff. It's a great question and thank you very much. I liked great question. It's a great question. Thank you very much. Read. It's a good question. [23:19] and the industrial world is a little bit, I would say behind, um, where some of other industries probably are today and that would be, and I can say that with confidence, just looking at our client list and clients that we've worked with all over the world. And uh, you brought up Chevron and some of the oil and gas companies as an example. I'm originally from Michigan. So when I think industrial, I'm thinking Detroit, right? I'm thinking General Motors Ford. I'm thinking of all the tier one, tier two, tier three suppliers in that industrial world that helped support those types of folks. What's interesting is that, and this is not a typical of, of people in the industrial world. So all of your listeners who are in industrial, um, I know so many folks in the industrial world where the founder and the CEO happens to be an engineer. [24:12] They are this, they are the smartest kid in the room. Okay? But in, but in their world, they don't think like marketing people. They think, how do I make a product better? And they think about how can I service my clients and be able to do that, which is social media and the world of digital media is more about what I call humanizing your brand. So if so, so if. So, if anyone who, my God, you have a lot of engineers, might be the listen to this show. And that means that means there are note takers. So your first note that you're taking today is humanize your brand. That I just did. There you go. The way he used that in a. a. Oh look at that. You're so old. Do you use a pencil? My God, that is a pen. Okay. He uses a feather usually for you. Are you on a pc there? Are you? Do you guys use a map? [26:44] those for a company? If all you're doing is supplying a widget to a bigger company? Yes. I'm going to interrupt now. We're going to take a break because I want to be able to really expand upon and give you a lot of time on that because that is exactly where we need to go. We're listening to a Luke Wyckoff. Why cough and uh, we're really pleased that he is here, that he's taken time out of his busy schedule. So stay tuned and we're going to find out a lot more about why it's important for industrial companies to humanize their brand. So stay tuned. [27:19] You're listening to the industrial talk podcast network. All right. Get your calendars. Okay, I'll wait. I'll wait. Just go get them. All right. We've got a couple events that you need to take note of. These are sponsored by those wonderful people that reliability web. They're the ones that are passionate about reliability asset management, of course maintenance. They do it all. Go out to their website reliabilityweb.com now, July 17th through 19th as July 17th through the 19th. This is a New Orleans, Louisiana, right around the corner from where I'm at. This is the vibration institute. This is the asset conditioning, a management training symposium. You got to be there because I'm going to be there and I want you to be there so that we can talk. The next one is maximo world. That is August seventh through the ninth. This is in Florida, like Bueno Vista. Now anybody that's anybody who's interested in Maximo will be there, so you need to be there. [29:03] upon it. So Luke, let's, let's go into that. 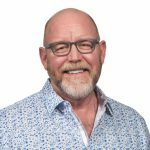 We were, we left off talking a little bit about why, why have maybe let's say a LinkedIn, Facebook, whatever the platforms might be for a company in the industrial world. You know, I, I remember kind of takes me back to the very beginning days of social media where I was speaking with someone and we'll just say the big three in Detroit. And we were talking about using social media at that point in time for recruiting people, you know, finding people to come and work for your company. And this person who, uh, was a vice president of human resources within this industrial space said, blue collar people aren't on Facebook. They don't use that type of technology. No Way. And I turned, I turned around and ran a report for them and said, well, it's, it's interesting that, that you think that because a, I will, I will prove you wrong over time. [30:12] And sure enough, sure enough, a three or four years later when they did their own reports, uh, over 94 percent of their entire workforce. We're on Facebook and they just never saw that coming. By the way that Vice President of human resources is no longer there. Does he wear for your company Social Media Energy? Uh, no. While we will hire people that are smart, that was not a similar moment when you said that, I was like, wait, this loop, believe this because we need to delete this. Well, when I was taught, when I was talking to them and that was saying, you need to be on all the different platforms. And they're like, why? Why should I be on YouTube over twitter? Why should I be on Facebook or LinkedIn? And I said, because the people that would follow your company or follow your brand, people who are customers, people who would even care about you, they're not usually set into just one thing. [31:06] You're going to have people just want to just, you know, I love to just drive Ford mustangs. I'd like to just drive Audi a force. There are people who are just loved to use twitter. That's there. I mean there's some people just prefer Facebook. There are folks who are like, I hate both of them. I only use LinkedIn. Well, that's great. The great thing about social media is you can be in all of those places for the same cost because social media is free. One of my favorite four letter f words, so if you want to be in each of these places because you can be the only effort. The only effort it takes is when you put the content out into each of those spaces. The rules are a little different for how much content you can put on twitter compared to how much you can put on Facebook or LinkedIn and other places. [31:56] So the reason, there's two reasons why I say any industrial companies should be in those spaces. Number one is that you want to be where your fans are, whether they are fans, customers, future clients, future employees, you want to be where they are. And number two, it helps your search engine optimization, which is a very interesting term that people talk about. I like to simplify Seo when I talk to people and say, what would a third grader type into Google in order to find your company, your products, your services, and your industrial world. What is a third grader type into Google and those key words that they typed into google, they'd better be spread throughout the, throughout your website and throughout the verbiage on your social media so that the average person can find you digitally and that those are the two reasons why you want to be in multiple areas. And do you remember when your grandfather used to say the squeaky wheel gets the grease, gets the grease, so you need to squeak in multiple places in order to get noticed in that digital world. So that's my first, my first point that people can take away of why they need to be in multiple social media spaces. [33:17] I like that. That really is. That's good. Yeah. Because it, that, that, that encapsulates the reason. But when you humanize what, what do you mean by humanizing outside of these, uh, posting because this is what happens. I've got a widget. It's a shovel. Whatever it might be, I got a, I got the best shovel in the world and I'm going to post about my shovel. What do you mean by that? To me is like, okay, whatever. You got to shovel, but how do you characterize. [33:48] Let's, let's, let's run with your analogy. Are you ready? I'm sitting and I'm ready. All right. Well let's, let's that, because my question is this is who made that shovel people? What's their story and someone who makes that shovel. Did they, did they just a beat cancer? Did someone just run her first five k? Do they have a story? Did the company who made that shovel that they get together and, and uh, all walked together in the, in uh, Susan b Dot Komen for breast cancer. Did they do something together as a team? Did they, uh, what type of things make them fun and interesting? I said, uh, I'm going to use your shovel analogy because I worked with an industrial company out of New York and I, I sat with them and I was and I were talking about because they had quite a few people following their shovel on, on Facebook and they said, welcome. Every time we post something new about our shovel, we only get just a couple of lights, just a couple of people connect. [34:53] And I said, I was talking to their head of marketing and this kind of marketing. It had to be about 127 years old. And I said to him, I said, I said, because you're boring. I said, there's only so many ways to talk about a shovel before, before people just shut you off. I said, give me control of your social media for one hour. And this was at the beginning of the meeting and I posted something that I shut my computer and we kept the conversation going about marketing. We opened up that, uh, opened up Facebook at the end of, at the end of that meeting. And they had 2,900 likes to my story. And what did I post? I found out that the gentleman who worked for the controller, the of this industrial company happened to hold the Guinness Book of World Records for riding the tallest unicycle. [35:45] Fantastic. I would like it had 38 shares. It hit 2,900 people. It was, it was the biggest posts they'd had in six months. And I had been there for one hour and the head of marketing, who again was, uh, was probably around when they would speak with, with smoke and, and I said to a and he said to me, he goes, what does that have to do with a shovel? And I looked at him and I said, I looked at him and I said, and that's why you don't get social media. Social media is supposed to connect with you at a heart level and find you interesting and humanizing your brand. It's not about your shovel, it's about the wood that went into that shovel was that would cut, was that would cut in some environmentally friendly way that you want to talk about was the handle hand carved by someone who had five generations of hand carving shovels. It's everything about and around that shovel that makes that shovel interesting. That's not the shovel itself. [36:56] That's awesome. Yeah, that is right. That's genius. I, I'd like to just sorta thank myself for starting that conversation with the shovel and you did nothing, Luke. Yeah, that was. Oh Scott, man, I'm worn out. Get a sip of coffee and I'm ready to get going. See, that's. That's exactly right. Because we, there's, there's that thought, the thought that's out there that says, okay, now I've got a LinkedIn account. Okay, now I'm going to post the shovel and then, and then what's what's fascinating to me, and I've been on this journey, let's save this podcast journey. This thing, tip of the sword type stuff, is that the information is out there. It's not as if you can't find it and if you have a desire to say, well, I want to, I want to improve my, my digital media footprint. It's out there. It's just the execution and people just, they, it's, it's that. It's just a big leap for a lot of these companies. [37:59] It is, it's a huge leap for them. And many of them say, what do I even talk about? You know, what can I talk about, you know, in my company we have what we call the 12 buckets, the special buckets of content that we say, okay, your shovel is one, is one thing to talk about Yo, your industrial product, your solution, your, uh, I think that's one area of things to talk about. You know, what, you have amazing clients that work with you. Let's retell their success stories on your social media. Oh, I'm sorry. Are you all trying to grow as a company? My suggestion is take the top 10 to 15 companies that you would like to work with. They should be using your widget, your shovel, and let's retail their success stories on your social media. So now you're expanding your digital footprint and saying, hello company, we see you, we see the great things you're doing, and we're going to retell your story. [39:04] Hey, who supplies you the steel for that shovel? I bet that is doing some pretty interesting things too. Let's take one of their press releases and retell their story in your social media. So now you're talking, now you're talking to suppliers. Now you're talking about customers. Now you're talking about future customers. You're talking about cool things you're doing in the community. You're doing employee spotlights. There's people who are visionaries in the company. You're highlighting their thoughts. There's so many great things to talk about in social media. A good social media company will be like an investigative reporter who's working for the Chicago Tribune or the Detroit free press, who's digging in, finding those human interest type of stories, retelling them on your twitter, your Instagram, your Facebook, and that is where you are humanizing your brand. In an industrial world where if all you talked about was the shovel and you might as well wake up next to a used car salesman every morning who has a 19, 84 Corolla for sale and all you do is talk about enough about, well let's, let's quote the profit Bet Midler, when she said enough about me, what do you think about me? [40:19] Well, it's funny that you're saying that because, um, my old high school actually like, you know, of course, you know, high schools are trying to get in the social media game and they'd share like, you know, um, come check us out for the open house Saturday at three and it gets like one chair and then this year they started doing um, Hashtag faculty Friday and they highlight a faculty member every Friday and every Friday it gets like 40 shares, hundreds of likes, you know, like old students are sharing their teachers they liked. And it's like you said, it's just humanizing the product. The product in this case is the school, you know. And it's amazing how when you don't just focus on the business aspect to make it like in a personable, people respond a 100 times better. [41:01] Like you said, 100 percent, right? You're looking for those great stories and it even in the industrial world, yes, we have a product. Do you have a solution? We're going to so many great stories around you. You have to go find them. [41:16] So let's say I added this, this, this is a category that is with many industrial company. What would you recommend? Like the first thing I said, okay, I hear what you're saying there, Luke. I want to get started, but I don't want to get started. I wanted to get started, but what? What, what would you recommend that that one simple little step to take to just say I'm on a journey here. [41:47] Then I would only pick three. I picked LinkedIn, Facebook, and YouTube. Unless of course, unless of course a majority of the people that either brought by or want to follow your product are under the age of 30. Then I would end Instagram. [42:04] But the reason why I'm. The reason why I picked those three is all of them are very searchable by google. One of them happens to be owned by Google, right, and you're seeing a large, a percentage or a large of that were they were things are shifting right now and go is going live, taking, taking broadcast live and being able to do a video and when I and when you do video within social media, you have to. It has to be short. You know the days of I want a company video that talks about our product or I want a company video that shows our shows, our culture of our company. I'm telling you, it's smarter in the world of social media to have 10 videos that are 45 seconds and launched them over a year than it is to spend the money to make one video that's three and a half to four minutes that you're going to use one time. [42:57] Do you think that the also, one of the things that I've witnessed in, and I could be completely wrong because I. I'm used to being wrong, is even the quality that they. There is a a point of diminishing returns, so I see, I see videos out there where somebody is just say, hey, here's my, my iPhone because I do have an iPhone because it is what I have and I'm close to apple anyway. They just take a video and it's 45 seconds, but it, it's, it's not that high end quality. Do you find that there is a point of diminishing returns where people will say it's got to be fantastic, it's got to be perfect, and then they miss the opportunity. [43:38] Actually, people's expectations have gone down considerably over the last 10 to 15 years when I say that, as you expected 10 to 15 years ago for it to be high end video quality types of things and now it's almost acceptable because that's how people have watched video. That's why the growth, the entire growth of YouTube, uh, you know, 90 percent of that growth was just videos shot with phones. So people accept that a lot more often. It doesn't take a lot of effort to throw that iPad, you know, on a tripod and that you don't have to have the full fledged video team in order to make a relatively good quality video. Does that make sense? Now I know now I know you've been, you've been around so long that you saw Lazarus come back to life. So I remember seeing the first Iraq. It was like dirt rock. [44:35] So I want you to and the folks to think about, um, who are listening to this podcast. Many of you remember shooting reel to reel. Yeah. You know, you remember shooting, you remember shooting a in the sixties and seventies with those, with those film cameras. You still enjoy going back and looking at those and not one time, do you ever think to yourself, man, I wish I would've had a four k camera to shoot that in? Nineteen 74. You're not thinking like that. You're enjoying what's on that film now, right? Same thing happens today. So you, you're filming that and there's not, there's not all of us have a little bit of Siskel and Ebert and us, but I think for the most part when it comes to the quality of the type of video that you're going to do, it does not need to be Spielberg quality. It just needs, it just needs to be a good enough and, but it's more about the content of the video than it is now. It does time enter into it. Go ahead. You humanizing your brand with that video, then you're winning. If you're humanizing your brand with your content and your social media, you're winning. [45:48] That's. Yeah, that's perfect. Yeah, I mean, and when you get right down to it, it does time enter into it because my, my, I've done this a couple of times. It's like, okay, I got to get something out at time is, is very important. And, and if it doesn't resonate, uh, I can, I can pivot and I, but it's, it's the time you can compress the time pretty rapidly. [47:11] right. And would you recycle those videos? Yeah, I'd like to. I'd like to put them. I like to get them up there. I put them on YouTube for our clients. And remember when I went back and said, what would a third grader type in to Google in order to find your company or your service to find your shovel that we're talking about? Those key words need to be typed into the description, uh, inside of your YouTube so that the average person can find that video. Yeah, but you're us having a conversation. I'm Luke about organic versus a pay to play. Yup. Let's debate it. Let's expand upon that. Native play is absolutely a reality. The organic world and the social media, you might as well get rid of the word organic. And you heard it here today that I said that now everyone who, uh, who's bought a maybe a Chrysler or Ford in the last 10 years, you've got this amazing deal as you drove it off the lot that you get XM radio free for a year, right? [48:20] And so, and when you're two weeks away from that xm radio expiring, you start getting an email or a text for XM Radio going, hey, guess what? Um, you know, you're two weeks away and you blow off that email that hey, you're a week away, hey, you're 48 hours away, xm radio and you blow it all off until you're driving into work in the morning and you can't listen to Howard stern and you freak out if you pull out your credit card, you pay that, you pay XM Radio and all of a sudden now you, now you have your xm radio for another year. Social media did the exact same thing. They said, okay, you want, you want to, you want to build up all your fans and you could be a lot of industrial folks today who are listening that already have a Facebook page. [50:51] you know, and I'd, I'd love to leave with three free things. So the first in a recap would be where your people are, which I talked about the beginning of this podcast, so you know, if they're using twitter, be on twitter. If you're there using LinkedIn, be on LinkedIn. If they're using my space, that's your issue. Not Mine, but I think that if they are, you know, you need to be where they are. That is number one, right? The second thing is humanizing your brand. That means mixing up your content so that you are interesting. Be The investigative reporter, find the great stories that are not just about your product or your solution within that industrial world, but be able to look at the people side of what you're doing. Be The thought leaders in your industry and let other people know what those thought leadership pieces are. [51:47] The third thing was this is a pay to play world. Go into it with that expectation that this is going to cost money to find new fans, new customers, new employees. You wouldn't believe how many industrial companies out there tell me right now the industrial companies, because I know you're listening right now. How many of you are struggling to find high quality employees? Answer everybody. Everybody raise your hands, so let. Let me tell you this. Where is where is the most? Most of the people that you're hiring are under the age of 35 right now. Show me that incredibly creative ad that you've launched on Instagram where 95 percent of your workforce is using more than eight times a day. Tell me where that ad is right now and then and if you're in, if you're listening to this podcast going, we've never used social media to recruit people before. [52:50] You're already behind the. You're already behind. You need to be using it, so be be serious about wanting to do it. Be Serious about humanizing your brand and then have the ability to take the energy and the effort to allow the world to see it. I was working with an industrial company last parting shot. I was working with an industrial company and they said, how do you measure the success of your social media like this? And I said, you have 28 trucks sitting out front that we're all accustomed painted with your, with your logo and your brand and your company name on those 28 trucks. I looked at the CEO and I said, how do you judge the Roi of those 28 painted trucks? And he just looked at me. He looked at me and said to Shea, nicely done. I said, because about 20,000 people might see those, uh, might see those trucks today with one paid digital ad. I'll have 300,000 people seeing your story and your logo for one half of what it costs for one of those trucks. [54:04] Usually. Yeah. Usually I was always amazed. I've been running some ads. I'm not to the extent of what you do and your clients do, but I'm always amazed at, uh, the ability to analytically see what's happening with that ad, but, but more importantly, the cost is like pennies on the dollar. Yes, it is. It's like don't go. Okay then. And you can pivot. You can move around, you can do whatever you need to do with that Ad. It's amazing. [54:34] Well, those of you who know how to use the force already know how to get a hold of me. Hey, this is Luke. Why Cop? He is the cheap visionary officer for Social Media Energy out of Denver. He spent time with us. He, he sort of weathered the technical storm and me rebooting this whole thing, but he's a champion because he just sort of got back on. I called him and he got back on. We're just like, as if nothing really happened. Tell me that book. One last thing. What's that book you want to recommend? [55:54] you just name dropping all over the place. I know. Read and I read, this. Read right now is Hashtag King of the 23 year old. So you got, you've got the king, the prince and the adjuster. All in one person. [56:13] That's right. I like that Hashtag. I'm going to use that. Schedule it. Yeah. Hey Luke, thank you very much. Really appreciate your time. Thank you for joining the industrial talk podcast. You listeners out there, you got to look this gentleman up. He's out on your year to got a LinkedIn page. You got your company page out there, you've got Facebook, you're everywhere, and if you can't find Luke, that's my fault. I was just gonna say. I mean she's absolutely. Thank you again and listeners. Standby. We're going to be right back and thank you once again for joining the industrial talk podcast. [56:47] You were listening to the industrial talk podcast network. Alright, we're going to make this one quick because that was a long interview because Luke has all the information. He is an amazing man. He split time with us and he shared with us some incredible information about digital marketing. You know, I just, I just want you to be successful. Right? And these are tools that are available to you and you can, you can access some pretty much pennies on the dollar quite frankly. But nonetheless, they're out there contact Luke because he knows what he's doing. Thank you very much. Once again for joining the industrial talk podcast. I've finished my macros if you were concerned about it because men will tell you it takes a long time to eat those bad boys. So anyway, have a great day, have a great week, have a safe week of course, and a b on the other side because we've got other guests that are focused on your success as an industrial professional and in a dust rail company. So thank you very much once again. Talk to you later.